Information: In 1923 Robert Urie introduced the large 4-6-0 Class N15 for increasingly heavier and frequent passenger services on the London and South Western Railway (L&SWR) that necessitated more powerful locomotive designs. Details: The N15 design incorporated many design features previously proved on the Urie H15 design, but featured larger driving wheels for increased running speeds over the longer routes to the West Country. The design incorporated two outside cylinders with high running plates provided to ease maintenance. 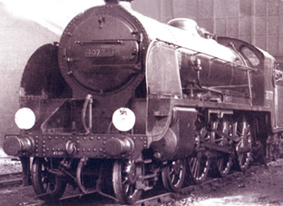 A total of 74 N15’s were constructed in three batches with the first and third batch being produced at Eastleigh whilst the second batch was constructed by the North British Locomotive Works (NBL) in Glasgow. Consequently the class became sub-divided and often referred to as “Eastleigh” and “Scotch” Arthur’s. 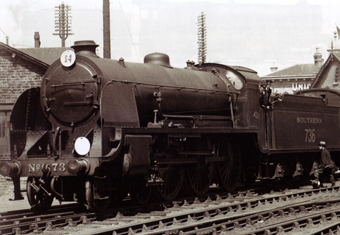 Improvements to the original design were incorporated by Robert Urie and later Richard Maunsell were to include significant internal modifications, including super-heating as well as external fitting of double chimneys and smoke deflectors being fitted to the first batch of Eastleigh built locomotives. As the Eastleigh works were tied-up with other production during Maunsell’s tenure the second batch of King Arthur’s (30) were out-sourced to NBL and were built to incorporate the improvements made to date. A third batch (14) was produced at Eastleigh, finally completing construction in 1926, by which time further modifications to the design resulted in the completely new Lord Nelson class of four cylinder locomotives. To further complicate matters of design and appearance, variations to the final batch included fitting ten of the locomotives with six wheeled tenders in order to be turned on the small diameter turntables associated with the central section of the former LB&SCR). Due to the large number of batch builds and subsequent improvements during rebuilding, individual members of the class had many detail variances. The class all were named after characters associated with the legend of King Arthur. During their lives they carried many liveries associated with the Southern Railway, culminating in the corporate British Railways lined green livery appropriate for top-link passenger locomotives. In service the locomotives proved popular and were easily maintained, resulting in long working lives. Ultimately route electrification and availability of more modern Bullied designs made the class redundant. Although class withdrawals commenced in 1953, it wasn’t until 1962 that the final member was withdrawn. Probably due to the fact that they were all taken out of service before preservationists began to realize the implications of the Modernisation Plan, only one member number (30)777 “Sir Lamiel” was preserved where she currently resides in operational status at the National Railways Museum in York.